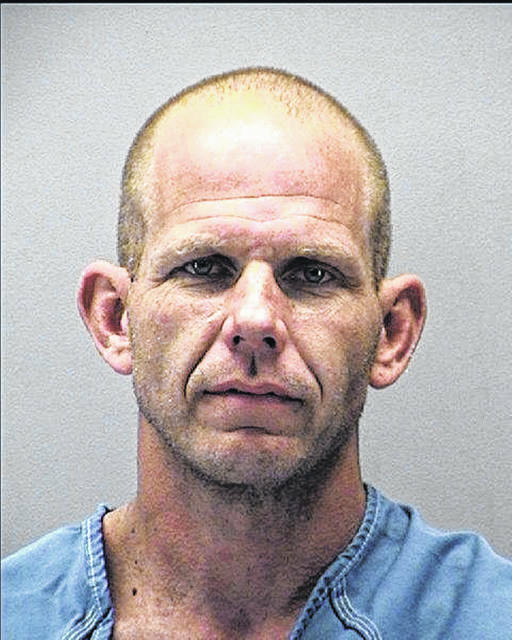 MIAMI COUNTY — A Troy man who drove his vehicle and struck a police officer who was on patrol on a bicycle was sentenced to serve 18 months in prison on Tuesday. Glenn Goudy, 40, entered a plea of guilty to fourth-degree felony assault of a police officer by Judge Christopher Gee. Gee called Goudy’s conduct “highly egregious” and he put the life of a police officer in danger from his actions. Gee also sentenced Goudy to serve six months in Miami County Jail for failure to comply and suspended his license for three years. According to reports, on May 5, a Miami County Sheriff’s Office deputy was on patrol on the bike path area and saw a vehicle near a pull-off area off of Dye Mill Road, Troy. The officer saw Goudy and another woman asleep inside the vehicle and woke them up. As the officer was relaying information to dispatch, Goudy sped off while the deputy’s hand was still on the door handle, causing a hand injury. Goudy tried to drive off and became stuck in dense honeysuckle, put the vehicle in reverse, nearly backing over the deputy. The officer then followed Goudy as he drove on the bike path, nearly striking two individuals as he fled. Michael Henson, 60, of Houston, was sentenced to serve two years in prison for third-degree felony OVI by Judge Gee on Tuesday. Henson has been convicted of multiple OVIs. Gee suspended his license for 10 years, fined him $1,350 and put six points on his license. Following Henson’s sentence, “You need to go to prison where you can’t drink, and if you do, you can’t hurt anybody,” Gee said.